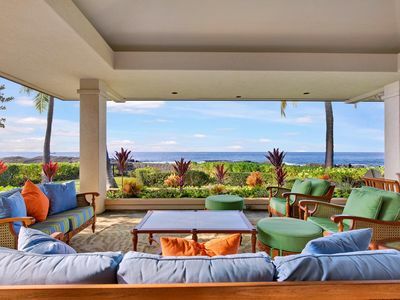 A tropical experience awaits you in a quiet setting at Keauhou Resort. 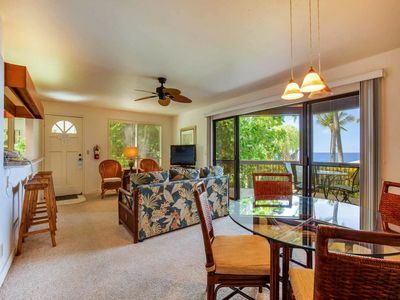 Our remodeled condo is a comfortable, and well equipped beach vacation home. 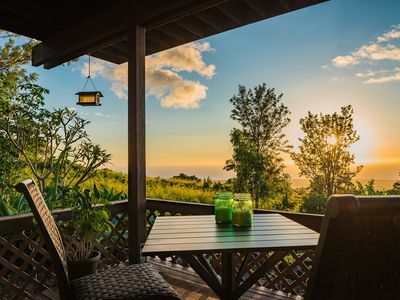 The soothing, lush green color palette with mango color accents, remind you that you are in Hawaii. The kitchen features maple cabinets and generous counter space, and has everything that a cook could need. 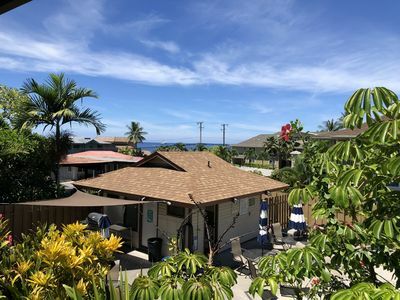 This one level unit has a remodeled bathroom, with a newly retiled, walk-in shower, with grab bars and a bench. 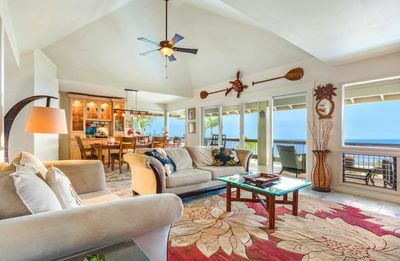 The condo features island style furniture and has a tiled floor throughout. The wall of louvered windows and opposite wall of floor to ceiling glass make the unit airy and light. 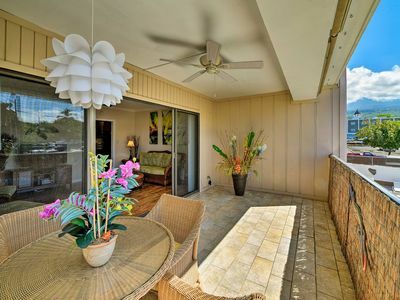 This townhouse-style condo is a desirable end unit opening onto a lush, private garden setting. 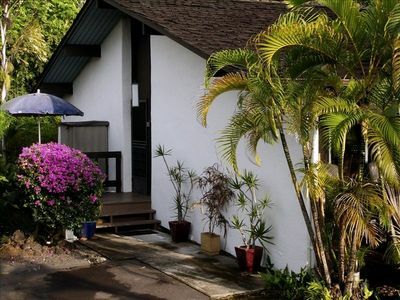 The driveway leads to adjacent parking, steps from the front entrance. 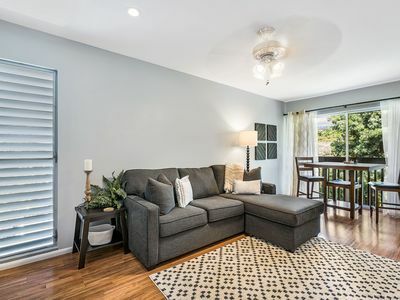 Our 850 square foot condo features 20 foot cathedral ceilings with four large fans, an open space layout, and decorator touches throughout. 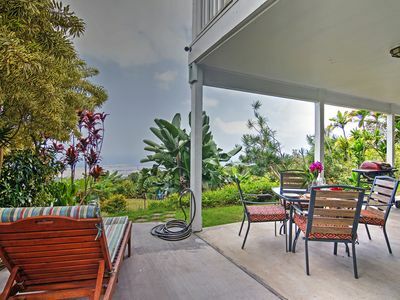 Dine on our 200 square foot lanai, while enjoying the distant , but lovely, ocean view, and the tropical, award-winning landscape of swaying palms, bougainvillea, plumeria, hibiscus, and mango trees. Meander down the garden path, to the two swimming pools. Included for your use are beach towels and mats, beach toys, beach chairs, boogie boards, and a cooler for your refreshments. Our kitchen is well equipped. 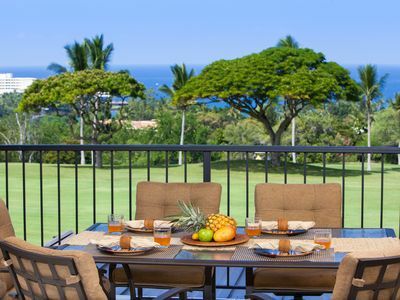 Our lanai includes an electric barbecue, and a full patio set as an option to the indoor dining area. 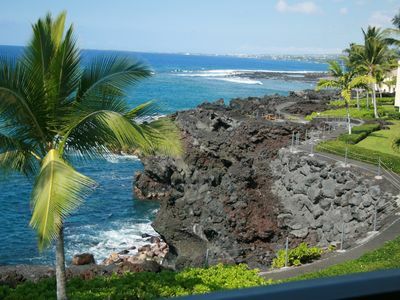 The Keauhou Resort is well situated adjacent to the Kona Country Club, featuring two spectacular golf courses. 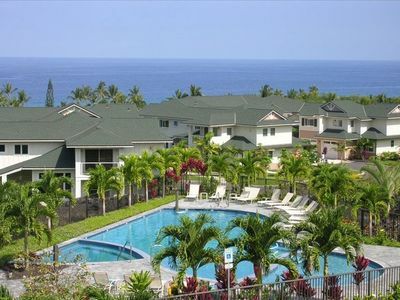 From our condominium, you can walk a block to the Keauhou Shopping Center, where you can find groceries, restaurants (Sam Choy's, Kenichi Pacific, Bianelli Pizza, Peaberry & Gallette, and others), gift shops, a gas station, a movie theater, post office, and other amenities. 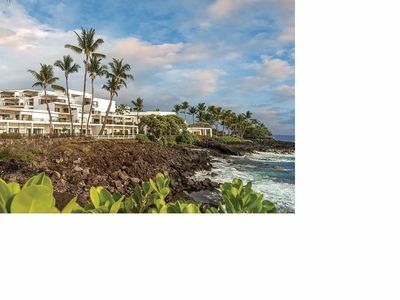 On Fridays, the shopping center features many daytime activities such as lei making, ukulele lessons, and a Hawaiian show at 6:00 PM. 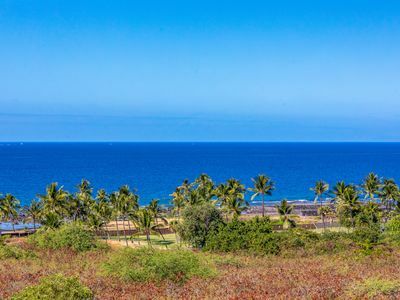 An eighth of a mile down the road in the other direction is the beautiful Keauhou Bay, where you can find fishing charters, ocean, kayak, and snorkeling tours, volleyball, picnicking, and fishing. 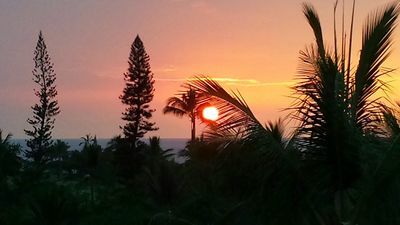 The very popular Fair Wind tour leaves from here. 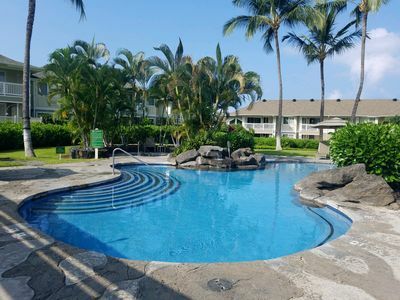 The Sheraton Keauhou Bay Resort is on the opposite end of the bay, less than a mile away, where you can find restaurants, a bar, entertainment, manta ray viewing, and a Kona coffee café for your morning enjoyment. 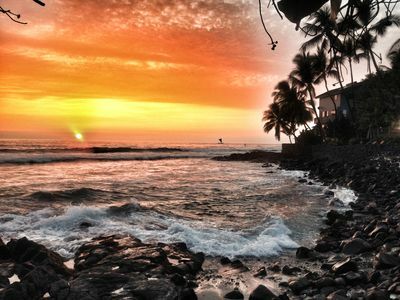 In the other direction, a mile towards Kailua Kona town, is the popular 'snorkel beach', Kaaluu. 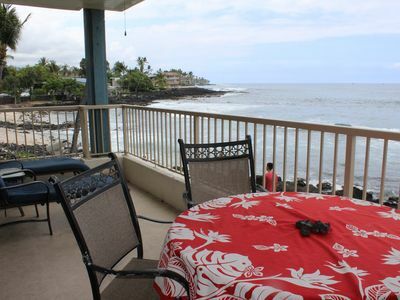 Hale Alaula - Private hot tub and ocean views!! 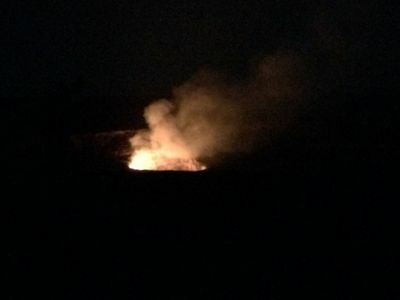 Close to town!! 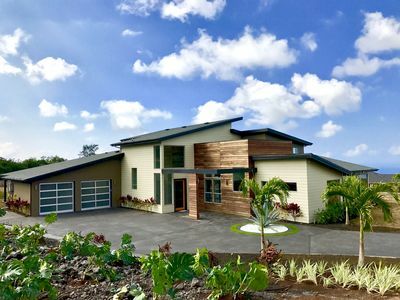 Come Home To The Big Island! 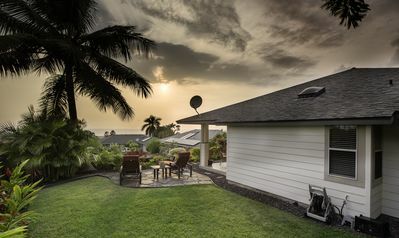 Kona sunsets along with resort style amenities.